Spurs Hire NBA's First Female Full-Time Assistant Coach : The Two-Way "I'm just thrilled for the opportunity to coach these unbelievable athletes," WNBA star Becky Hammon says at a news conference announcing her hire by San Antonio. 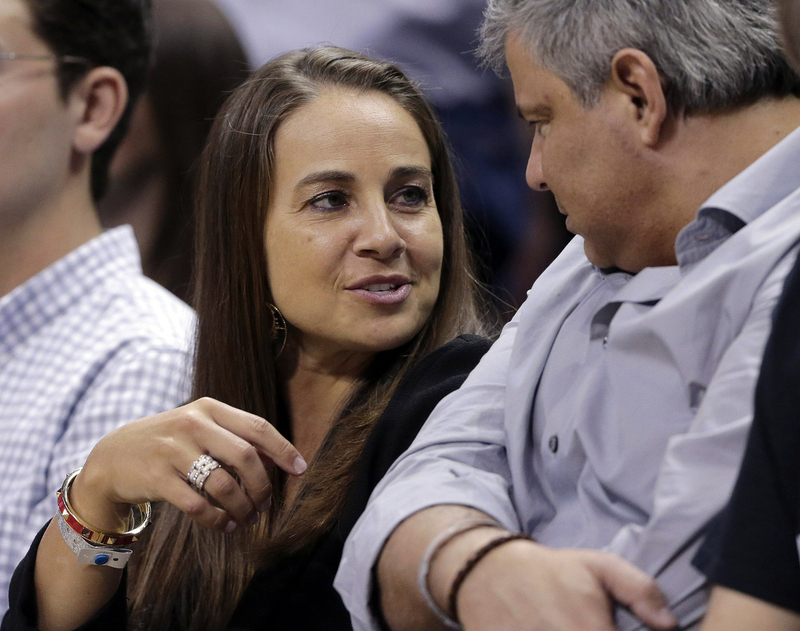 The San Antonio Stars' Becky Hammon, seen here attending a Spurs playoff game, has been hired as a full-time assistant coach, joining the NBA's reigning champions for next season. "I'm just thrilled for the opportunity to coach these unbelievable athletes," Hammon said at a news conference about her hiring Tuesday, according to local TV news KSAT. Referring to her new boss, Spurs head coach Gregg Popovich, by his nickname, she added, "I know I have a lot to learn, and who better to learn from than Pop"
"I very much look forward to the addition of Becky Hammon to our staff," Popovich told NBA.com. "Having observed her working with our team this past season, I'm confident her basketball IQ, work ethic and interpersonal skills will be a great benefit to the Spurs." In the WNBA, Hammon has been a star in more ways than one — in her 16 seasons, she's been to six All-Star Games and was named as one of the league's top 15 players of all time. She also leaves as the Stars' career leader in assists and 3-point field goals, despite spending half of her career with the New York Liberty. According to the San Antonio Express-News, Hammon spent time with the Spurs during their recent championship season, getting a feel for coaching in the NBA while she recovered from a knee injury and plotting her next career move. "I'm kind of just there, a fly on the wall soaking up how they run things over there in the film sessions," Hammon told the Express-News of that unofficial internship earlier this year. "I get a lot out of their film sessions, just listening to the coaches go back and forth on what they think is happening on certain plays." "Nancy [Lieberman] was head coach of the Developmental League's Texas Legends in 2009. Lisa Boyer, currently the associate head coach at the University of South Carolina, served as a volunteer on John Lucas' staff with the Cavaliers in 2001-02 while also head coach of the WNBA's Cleveland Rockers. But Hammon is believed to be the first full-time female assistant coach in NBA history. The hire brought further diversity to Gregg Popovich's staff, which also added European giant Ettore Messina as an assistant earlier this summer." In the NBA, there's also Natalie Nakase, the former UCLA guard currently working for the Los Angeles Clippers as an assistant head coach during summer league play. She began an internship with the team last September and worked as its assistant video coordinator — a position that will extend into the regular NBA season. In an interview with NPR's Eric Westervelt this past weekend, the 5-foot-2-inch Nakase admitted that it's easier for her to talk to the Clippers players when they're sitting down — but she also said, "If I say the right things, and things that can help them, then they'll listen, no matter how tall I am or if I'm a female."